Mazda MX-5 RF Performance, Engine, Ride, Handling | What Car? Just like the regular MX-5, the MX-5 RF offers a choice of two petrol engines: a 1.5-litre with 130bhp and a 2.0-litre with 181bhp. As it's a relatively light car, even the 1.5-litre version feels brisk, if not exactly fast, and revving its engine to the limiter to access its pace is all part of the fun. The 181bhp 2.0-litre also needs to be revved, but feels a lot stronger lower down in its rev range. It also has a significantly more enthusiastic top end. In fact, you often find yourself waiting until the heady 7500rpm redline before changing up a gear, such is the engine’s appetite for revs. Do this and the MX-5 gets down the road rather briskly. Both engines come as standard with a six-speed manual gearbox, but, unlike in the regular model, you do get the option of a six-speed auto ‘box. It's surprisingly smooth and responsive, and does well to keep up with revs. But, naturally, it does take away a lot of the driving fun and doesn't feel anywhere near as involving as the manual set-up. The MX-5 RF is softly sprung and offers a ride that is quite un-sports-car like as a result. It’ll soak up speed bumps and stays pretty settled even over awkward cambers in the road. In fact, pretty much whatever the road can throw at it, from large potholes to rippled sections of motorway, the MX-5 RF generally manages to filter it out. Even with larger wheels fitted – normally the death knell of a good ride – it remains comfortable. The 2.0 Sport Nav+ and GT Sport Nav+ models have firmer sport suspension with Bilstein dampers that transmits a little more information about the road surface to the car's occupants, but the ride is still bearable. The RF’s solid roof sections make it 45kg heavier than the soft-top, but you’d never know it, because it’s just as light on its toes, if not a touch better in the bends. 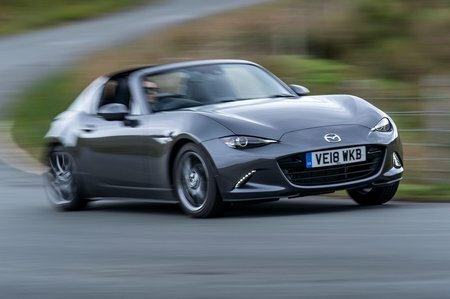 It offers the same rear-wheel-drive set-up that gives all MX-5 variants their nimbleness and ability to change direction quickly, helped in part by the well-weighted and accurate steering. The MX-5 RF also serves up plenty of grip, so you don’t feel afraid to use all its performance on the road. Compared with most similarly priced front-wheel-drive hot hatches, the MX-5 RF is a much more involving, playful-feeling car. 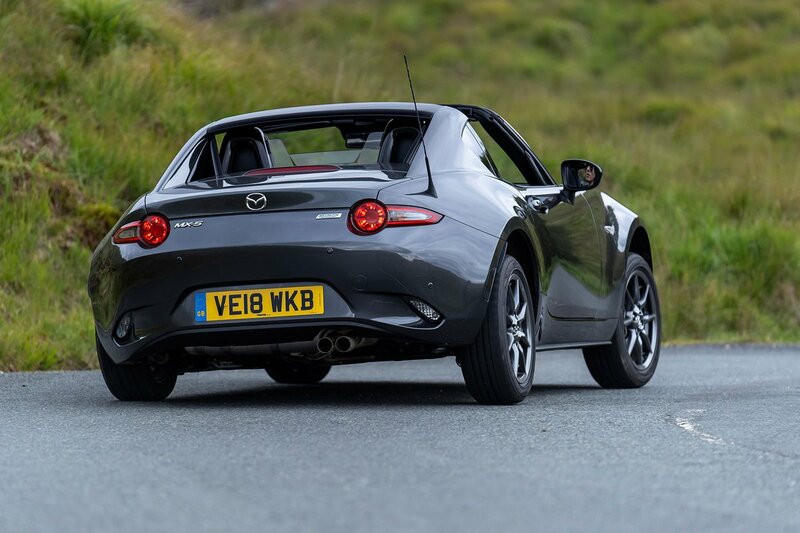 The soft suspension that gives the regular MX-5 such a comfortable ride also produces quite pronounced body lean through corners, but the RF has different suspension to help counteract its roof’s extra weight. That translates into a fraction less lean and slightly better control. 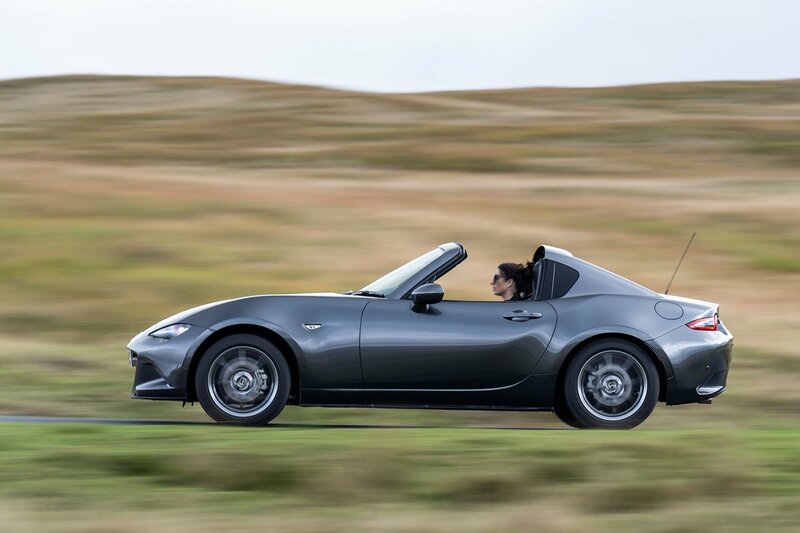 Sport models receive a stiffer suspension that keeps roll under much tighter control and also heightens the MX-5's keenness to turn in to a corner. 2.0-litre models give you more traction out of corners, too, thanks to a standard limited-slip differential. The whole point of the MX-5 RF's existence is the hard-top roof and extra soundproofing that make it quieter inside than its soft-top sibling. The thing is, though – we don't think the RF's clever roof is quite the answer it's billed to be. Yes, road noise is vastly improved, but wind noise is still pronounced once you reach about 70mph. We're not sure the RF delivers an improvement when the hard-top is open, either. Only the roof section and rear window fold away, leaving the ‘fastback’ section in place behind you. This creates a cocoon that helps shelter you from wind buffeting. However, once you hit 60 or 70mph, the wind whistles around the frame and creates more wind noise than you’d get in the regular MX-5. This is a real disappointment. Fortunately, there's better news elsewhere: both engines have a raspy exhaust note that, rather than being an annoyance, merely validates the RF’s sporty credentials.